How do I add an email account/address? 1. Type the email address to be created in the Email field. * If you manage more than one domain, make sure to select the appropriate domain from the pull-down menu. 2. Type the password in the Password field. 3. Retype the password in the Password (again) field. * You can click the Password Generator link to have a strong password generated for you. 4. Type the quota in the Mailbox Quota field. * The quota defines how much hard drive space the account will be allowed to use. * PICK Important: Due to mail server constraints, quotas cannot be greater than 2048 MB. Quotas exceeding this amount must be unlimited. * See how much disk space the account uses. * Change a quota limit. * Delete an email address. * Access an account through webmail. * Configure a mail client. Can I change my email quota limit? 2. Type the new email quota (in Megabytes) into the appropriate field. For an unlimited account, click unlimited. 3. Click Change Quota to store the new value. * If you do not wish to change the quota, click cancel. Your default email address is listed under the Default Email Account heading. 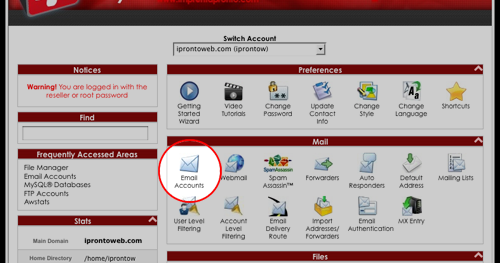 This is a special email account set up when your control panel account is created by your web host. The account's username and password are the same as your control panel account name and password. How can I forward my emails without leaving a copy in my account? Where does mail for root get forwarded to? Can I access my e-mail from a remote location using another PC? How do I set up an out of office reply for incoming emails? Choose the character set the email will be sent in by selecting an option from the drop field. Provide a body for your message. For example: "I'm currently out of the office until July 2nd. You can reach me on my mobile phone for any emergencies"
Can I set my email up so 2 (or more) accounts receive mail sent to 1 address? How do I block unsolicited mails ? "A message that you sent could not be delivered to one or more of its recipients." What does this mean? To do this, you will need to create an email forwarder in control panel. If you wish for the messages to only be sent to the file and not stored in a mailbox, do not create an email address, just create a forwarder with the name of the address. Can I create an email redirect/forwarder which will redirect 1 parent email address to more than 1 child address? When pulling mail from my control panel to my mail client, the mail remains marked as unread in my control panel's webmail. 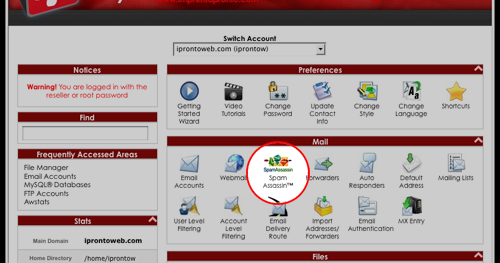 Is it possible for an individual user to access the webmail programs without going via the cPanel control panel? This feature allows you to change your control panel interface’s main password. To change your password, you need to know your original password. 1. Key in the original password under Old Password. 2. Key the desired password into the New Password field. * Remember to use a secure password that contains no dictionary words, and is comprised of upper- and lower-case letters, as well as numbers and symbols. * You may use the control panel password generator to generate a secure password by clicking the Generate Password button. 3. Confirm the new password by entering it into the New Password (again) field. 4. Click Change your password now! to save the new password. 1. Select a language from the Set Language to pull-down menu. 1. Type: http://www.DomainName:2083 into your preferred Internet browser. • DomainName is meant to stand for your website address. 2. Enter your control panel username provided into the Name field. 3. Enter your password provided into the Password field. • You will be greeted by a control panel startup page on your first login. We strongly recommend completing the Getting Started Wizard. Note: A colon symbol following an domain name denotes a specific port number. These port numbers are responsible for guiding data packets transmitted between 2 computers to specific processes taking place on either machine. Can I create a shortcut to a section of my control panel? You can create a shortcut by clicking, holding, and dragging the link(s) on this page to your desktop or browser toolbar. The shortcut will automatically be added to your toolbar or desktop. Mysql gives error of access denied for root@localhost? Make sure root pass is in /root/.my.cnf. How do I import data into MySQL? When trying to load a large SQL dump, I get ERROR 2006: MySQL Server has gone away. Postgres gives an error of 'Password authentication failed for user. How do I create a new database in SQL? You should check that mysqld is running first of all. If it is, check to see that it's looking for the correct UNIX socket. How can I backup a mysql database? Which port can I use to connect to a MySQL database with some programs directly from my computer? How does running a remote MySQL host impact MySQL services? How do I configure a MySQL database for remote connection? The mysql version displays a different version in phpinfo that what is installed on the server. The API version you see in phpinfo is the builtin mysql api included in php. If the buildapache application used the libraries and headers of mysql installed on the server itself, apache would not be able to work if the mysql version was hanged. Since mysql rpms are updated in the control panel whenever redhat releases updates, this could automatically break thousands of servers in a matter of a few hours, hence apache and php will always be built with the -builtin option. I see ERROR at line 2: Unknown command '\_'. when I list mysql databases. You are running mysql version 4.0.12 which has a bug that causes this error. Upgrading to a later version should resolve the problem. The second step depends on what operating system your server is running. Can users be assigned privileges to a certain number of MySQL databases and a different number of PostgreSQL databases? You can set the maximum number of total databases that user can create with packages, as well as when creating accounts without packages. X MySQL and X PostgreSQL.